The Metro Manila Film Festival (MMFF) 2011 winners have been revealed last night in a glittering awarding ceremony held at the Newport Performing Arts Theater at Resorts World Manila in Pasay City. Check out the results HERE. While Gov. ER Ejercito's "Manila Kingpin: The Asiong Salonga Story" emerged as the big winner of yesterday's Awards Night, sweeping the technical awards and bagging the Best Picture, the action movie still has to earn more ticket sales to win or even just catch up at the box office race. 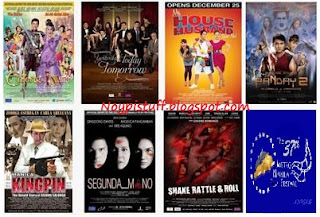 According to the 3-day box-office figures released by MMFF Executive Chairman Francis Tolentino, the action movie earned P7,957,716.50, just 6th among the 7 participating movies. "Enteng ng Ina Mo", the debut pairing of box office royalties Vic Sotto and Ai-Ai de las Alas, is on the number 1 spot with P91, 892,997.10 while Sen. Bong Revilla's "Ang Panday 2" collected P51,527,616.00 and on the second place. *There is a discrepancy on the reports regarding the earnings of "Yesterday, Today, Tomorrow." Kris Aquino earlier tweeted that the Regal Films movie raked in P10.1 million on the opening day. Let's just wait for Box Office Mojo's and the coming reports from MMFF executive committee to see if there is indeed an error in this initial report.